You could be forgiven for thinking Hollywood had done virtually everything that could be done with the comic-book, superhero genre. Since the misty days of the late 1930’s when Buster Crabbe first saved the universe in Flash Gordon’s Trip to Mars (1938), the idea of beings – both human and alien – battling forces intent on bringing about an intergalactic Armageddon have been a staple of fantastic films. Recent years though have seen an increase in the genre’s output, with new comic-book adaptations hitting the cinema every few months particular during the summer period. 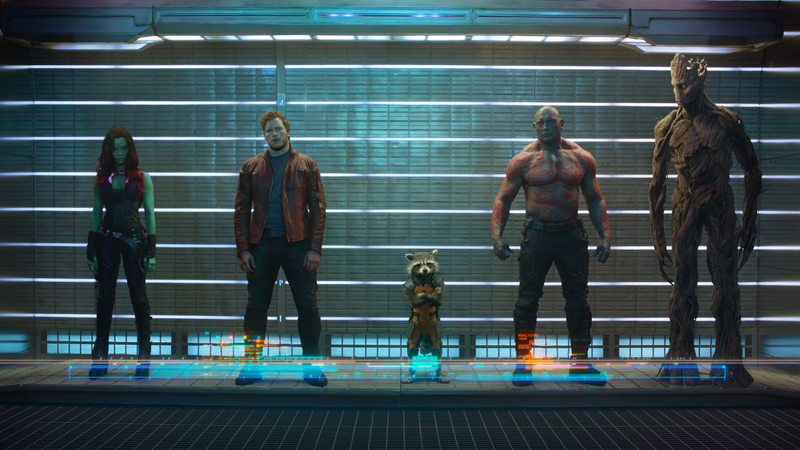 As a result – unless you’re a diehard fan – you may well say ‘not again’ at the thought of director James Gunn’s entry into the field in the form of Guardians of the Galaxy: let’s be honest – though it may represent the first time this set of Marvel characters were transferred to the big screen – once the pyrotechnics have fizzled out isn’t the result just more of what we’ve seen before? Perhaps yes. However, where many films featuring superheroes – such Superman, Spiderman and Batman etc (notice a theme?) – constantly try to inject life into their fading crusaders by rebooting the franchises and calling the results a ‘new take’, Gunn and his team have engaged a fresh approach. Though a clear pastiche to much of what has gone before – the influences of Star Wars (1977), Alien (1979), The Fifth Element (1997) and Thor (2011) will not go unnoticed by the sharp-eyed – it is all done with such obvious relish and verve that only a total curmudgeon would fail to be won over by the result. As with most movies which fall within this genre, what there is of a storyline is simply there to connect one eye-popping visual spectacle with the next. As it goes however the action follows intergalactic cowboy Peter Quill (Chris Pratt), a good hearted trickster and thief who has come into possession of a strange orb. Intending to deliver it to a client for a princely sum, it soon becomes clear that Quill’s not the only person with an interest in the object, as he finds himself fighting not just for his own life but also that of the whole universe, against some very unpleasant creatures who are literally not of this – or any other – world. The film’s real problem, if there is one, is that much of it will seem familiar to anyone with even a passing interest in Sci-Fi / fantasy. Many of the characters – including Groot (voiced by Vin Diesel), a talking tree reminiscent of something from ‘The Lord of the Rings’ and Rocket (Bradley Cooper), a wisecracking raccoon who (minus his futuristic combat fatigues) wouldn’t seem out-of-place in ‘Narnia’ – may not appear new, but then neither does the story: in all fairness there isn’t a lot for alien tyrants – such as Ronan, the film’s main bad guy played with gusto by Lee Pace – with delusions of grandeur on a galactic scale to do, other than go around blowing up any planet and its inhabitants who have the temerity to stand in their way. However where this approach could appear in other films as lacking imagination, here it is done with such candid self-depreciation that the viewer forgives all, as they are caught up in the whole mad experience. Even the humans – including a wonderfully camp turn from screen icon Glenn Close as the leader of the police force who protect the inhabitants of the planet Xandar, and the nonchalant central protagonist of Quill disarmingly underplayed by the hunky Pratt – are simply variations on old themes: Quill in particular looks like an amalgamation of the best parts of Rocket Man and Iron Man. Unless you’re a true aficionado of the ‘Guardians of the Galaxy’ comics, you are unlikely to get as excited as my friend who accompanied me to a screening of the film and was beside herself to see her favourite comic-book characters eventually make it to the big screen. On-the-other-hand if you take the film as a tongue-in-cheek homage to the glories of Sci-fi’s illustrious past, the outcome works surprisingly well, reminding you of the days when filmmakers and fans alike didn’t take themselves so seriously and enjoyed it all the more as a result.